Download guides, documents, templates, brochures and bulletins on SGSecure@Workplaces for both employees and employers to help strengthen your business resilience. 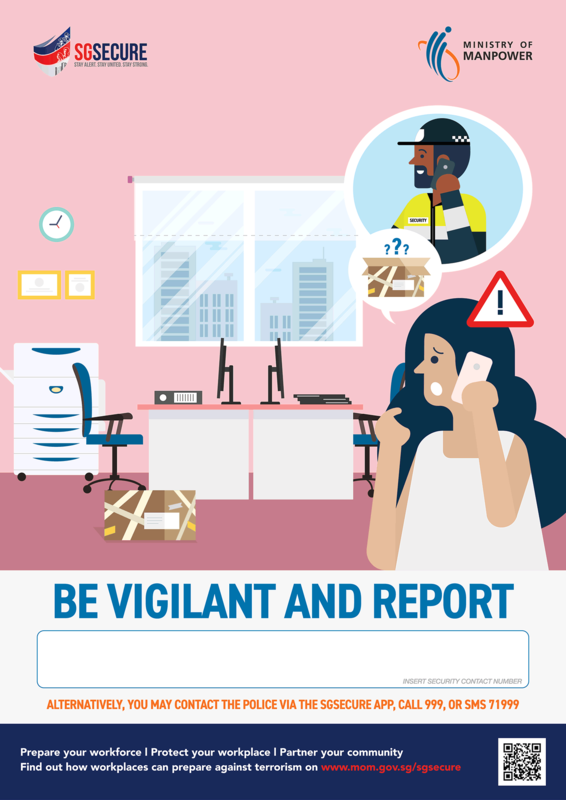 As a member of the workforce, you play a key role in raising workplace awareness on the possibility of terror attacks, as well as increasing preparedness levels. 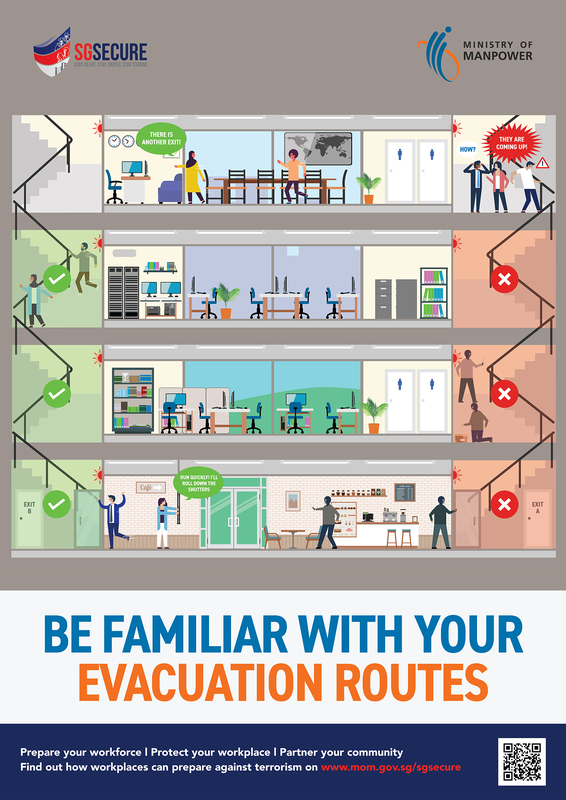 Download our SGSecure Guide for Workplaces as a go-to guide for tips and resources to raise preparedness levels at your workplace. Also available in Malay, Mandarin and Tamil. Whether you are an employee or an employer, we understand that your schedules are tight. However, preparedness is critical to minimise loss of lives and profits. 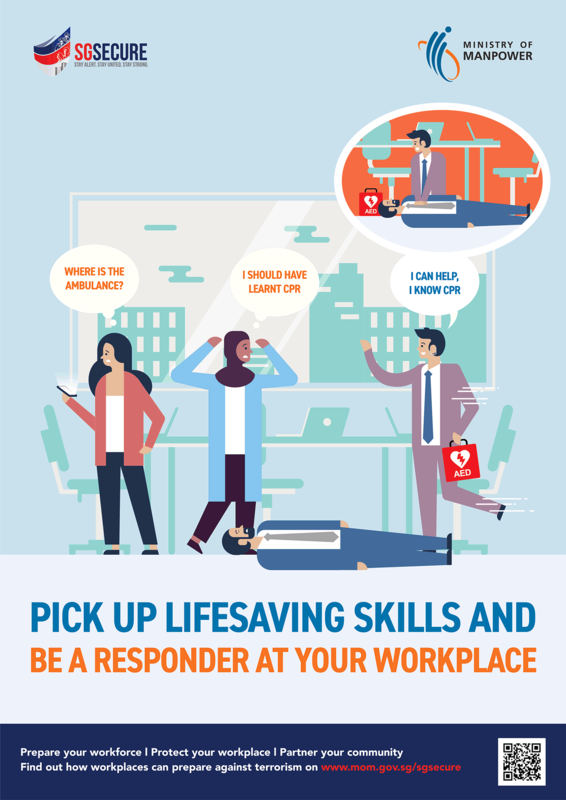 You can take steps to train your employees and ready your workforce to react to a terror attack. This will minimise loss of lives and disruptions to business operations. Train your employees and colleagues so that they can respond effectively in a crisis. 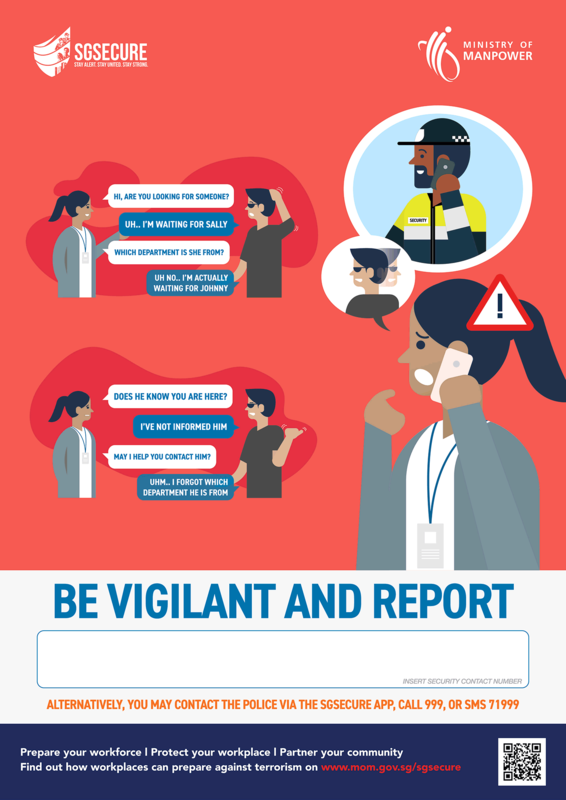 Know what to do if there’s a terror attack. Know how to help stop bleeding by applying improvised First Aid Skills (IFAS). Tips on what to do in firearms or weapons attack. Suggestions on how to prepare your workforce for a terror attack. Identify and develop a team of responders with relevant skills to minimise damage and loss after a crisis. Organise your company’s crisis response team according to functions such as crisis communications, human resource, etc. Train a group of employees in PFA skills so they can help co-workers cope with situations. Build a cohesive workforce that is resilient against attacks and can recover quickly after a crisis. Practical steps and initiatives to help you build a resilient and united workforce. Also available inMandarin. Tips to strengthen your corporate social fabric. Tips to build relationships within your organisation, and within your building or building network. 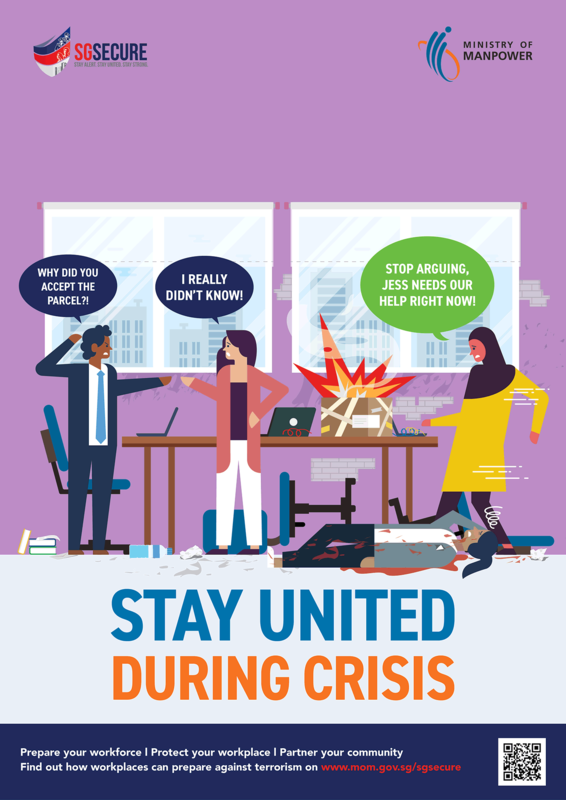 Tips to help workplaces overcome a crisis. Download and display the posters at your workplace. You can also give your co-workers to sensitise them to the terror threat. Print and distribute during security drills. You can also download and give your co-workers to sensitise them to the terror threat. Also available in Bengali, Mandarin and Tamil. You can take steps to build resilience into the physical and digital infrastructure of your business, and ensure business continuity even after a terror attack. Implement physical protection measures for your workplace. Recommendations to strengthen workplace protection. Manage your workplace’s safety and security risks. 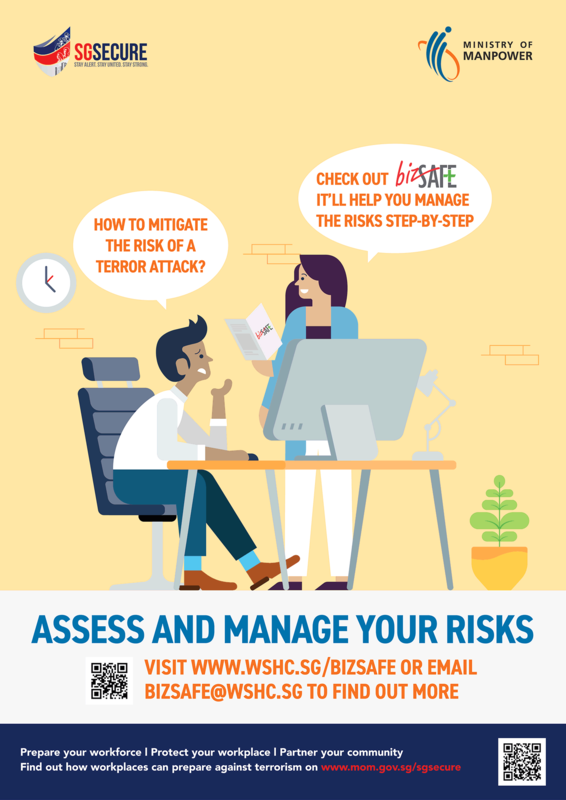 Sign up for WSHC’s bizSAFE to improve your workplace’s safety, health and security capabilities. Here are the resources you can use to create networks to help your organisation communicate information swiftly during crisis. Useful contacts to get information and to sign up for courses on emergency response plans, business continuity and other training initiatives. Provides overall view of your company’s crisis communication plan by listing out the call chart and personnel involved. Make a list of your employees’ particulars, such as next-of-kin details, emergency skills (e.g. CPR), drug allergies, etc. Tips on how to better communicate with internal and external stakeholders in the event of a crisis. Tips on how to strengthen community networks to support each other in the event of emergencies.